In any successful commercial goat farming, goat shed or housing plays an important role. 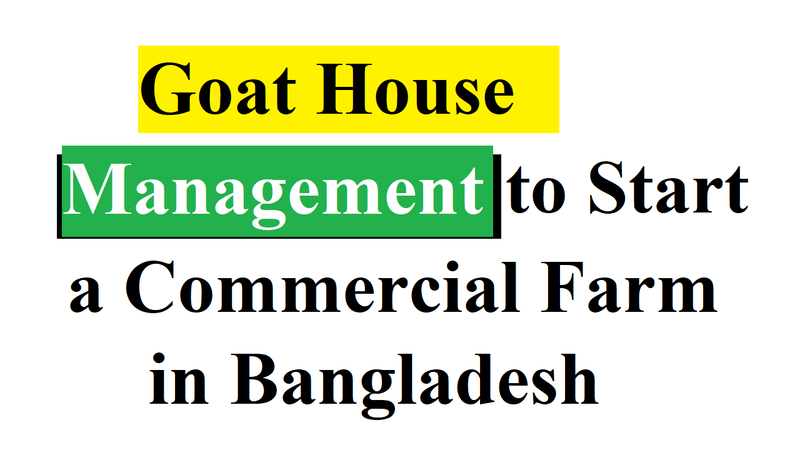 That’s why goat house management is crucial while starting a commercial goat farming business in Bangladesh. Also, you should plan for goat housing based on a number of goats. There is an option for going to construct a simple goat shed if you want to start with low numbers of goat and wants to invest less initially. But, one must know how to build goat housing for commercial goat farming business. As goat shed is required for security, it protects goats from unwanted predators like wild dogs, foxes, wolfs and snakes along with unpredictable weather conditions and to provide shelter in night times. You can get an idea on shed dimensions or size after planning on a number of goats to be raised. As goats are naturally very tolerant of all kinds of weather, they can adopt many different styles of housing. They are vulnerable to respiratory infection and hypothermia despite their hardiness when goats are under extreme wet and drafty conditions for long periods of time. Although their production of meat and milk is not affected when the temperature is between 0 and 55° F, they usually seek cover from rain, snowy conditions, and hot sunny weather. And it’s during winter months when they are kidding is the most important time for housing. If you’re in a goat farming business then suitable goat house management is very important. This is because and we have already said that goats need a house like other domestic animals for staying at night, security, preventing them from adverse climate, cold, sunlight etc. So, you must have to build a suitable house for your goats if you want to establish a profitable commercial goat farm. Well, let’s know about goat house management in details. Consider selecting a dry and higher place for making the goat house. Try ensuring that the selected goat housing area is high enough to keep the goats safe from floods. Goathouse floor should keep dry always. Ensure the huge following of light and air inside the house. Consider making a house in such a way so that it becomes very suitable for controlling temperature and moisture. Try keeping the house free from being dumped. Avoid letting the rainwater enter the house. Consider the housekeeping strong and comfortable. Try keeping enough space inside the house for taking rest. Consider keeping well facilities of cleaning well regularly. While it’s winter and rainy season it needs an extra care. As the most common house for goats, this type of houses is made over the ground. Also, you have options when making its floor that you can make it with brick and cement or simply with soil. If you can spread some dry straw over the floor in this housing system then it will be better. But, keep in mind that goat house management is focused on keeping the house dry and clean always. When this type of houses is made over the pole, the floor of the house heights about 1 to 1.5 meters (3.5 to 5 ft) from the ground. It not only is to keep the goat free from damping condition but protects from flood water as well. In this goat house management system, the poles and floor are usually made with bamboo or wood. And because it is very easy to clean, this types of the house is very suitable for goat farming. Also, as you can easily clean the closet and urine of goat form the house, diseases are also less in this housing system. This is the type of goat house management that’s totally made of concrete, and slightly expensive. However, concrete houses have many advantages and for example, it’s very easy to clean the house and easy to always keep your goats safe from all types of predators etc. Options are for you that you can construct the house either over the ground or over concrete poles. And both types not only are easily maintained but diseases are less in this housing system as well. But, among the goat housing system, this is the very expensive one. They require more space in accordance with increasing the body size and weight of goats. For example, if you consider for a house of 10 small goats then the equation will be like this: 1.8 meters X 1.8 meter X 2.5 meters, which is equivalent to 5.5ftX5.5ftX 8.5ft. But, if you think about the adult ones then you should consider 0.75meterX4.5meterX 4.8meter housing space for each one. Besides, 2.4meterX1.8meter housing space is required for the every Billy goat. However, if you can keep the nursing and pregnant goats separately it will be better. And according to the number of a goat on your farm, you can extend or decrease the area of goat house. As every goat needs their required space for proper growing and better production, you should keep it in mind. But, always emphasis on the comfort of your goats while building a house for your goats. And the main purpose of goat house management is to keep your goats living happily inside their house. So, you should ensure that the house is suitable enough to keep them free from adverse weather and all types of predators.